In many workplaces, mentions of compliance training elicit groans and grumbles around the water cooler. Employees may feel that these sessions take up time they could be spending on their actual workload. Or, participants anticipate that they’re in for another dry lecture covering nitpicky rules and regulations. Depending on how the training is delivered, they may be correct. But compliance training serves an important role within companies. First, it keeps employees safe and informed. It also aids the company in obeying laws pertaining to their industry and reducing liability. Different work environments will have different standards for how much and what kind of training is required. For example, a warehouse filled with forklifts and towering shelves will require specialized safety training in addition to more universal harassment modules. A company that develops Internet of Things-enabled devices will have to undergo more stringent cybersecurity training, lest a hacker accesses their network. Healthcare practices will require HIPAA compliance training. 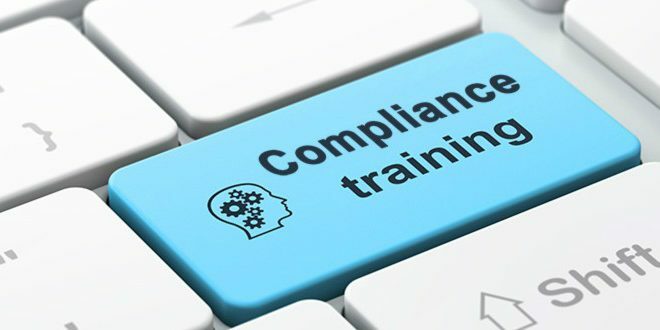 Despite these different requirements, the consequences of skipping or delaying compliance training can be costly for any company. Let’s take a closer look at some of the potential ramifications of postponing this crucial education—or canceling it altogether to save time. Subpar compliance training puts people at risk. As one study concludes, “A strong commitment to compliance translates into a better, safer workplace where people are better at their jobs.” On the flip side, a poor commitment means employees are doing their jobs without the knowledge they need. This can lead to anything from a musculoskeletal injury to a serious injury involving multiple employees at once. Your company should value employee safety, so don’t wait until an impending audit to train your staffers. Regular safety training is key to minimizing the occurrence of workplace accidents, reducing workers’ compensation claims and helping your staff stay out of harm’s way. Specific requirements vary by state, but many employers are required to host harassment training for employees. Failure to do so means your company has a weak defense because you can’t show you “exercised reasonable care” in preventing negative behavior. It also makes the workplace an uncomfortable and toxic place for your employees. So, not only does your company need a strong employee handbook full of concrete dos and don’ts, but it also needs a regimented training program to back it up. This way, no one can use the excuse that they weren’t aware of a certain law or rule. Which sounds better: A company culture built around miscommunication and confusion, or one built around information and transparency? Although nobody will fine you for having a poor company culture alone, employees will notice. Not only should you stay current on compliance training, but you should present this important material in an engaging way. For example, allowing employees to send in anonymous questions, poll responses and comments via their mobile devices helps sessions stay engaging rather than one-sided. The Occupational Safety and Health Administration under the United States Department of Labor has its own compliance standards for employers to follow. Failure to adhere to these standards may result in audits, fines and other unfortunate penalties. It’s also important to note that your training “must be presented in a language and vocabulary that employees can understand.” Make sure you’re accommodating your entire workforce when planning these sessions. If you need to bring in a multi-lingual instructor or make accommodations for team members with handicaps, plan. The reason this training is so important—especially in notoriously “dangerous” industries—is that it’s meant to keep people safe. Potential consequences of skipping or delaying compliance training can range from monetary punishment to disengagement to employee injury. Make sure you’re not missing any vital training sessions. Then look at your upcoming schedule and think about how you can make these lessons as effective as possible.